Syrian government forces are struggling to retake the city of al-Qaryatayn from ISIS sleeper cells and their supporters. The army has retaken Jabal Hazm al-Abyad west of the city and few points in its eastern entrance. Local sources report that artillery units hit terrorist positions inside it. The Hezbollah media wing in Syria has released a statement saying that members of Liwa Shuhada al-Qaryatayn and Liwa Shuhada Mahin [two groups described by the US-led coalition as moderate opposition] are among ISIS units operating in the area. However, the media outlet released no photos or videos to confirm this claim. ISIS terrorists also continued their efforts to encircle the strategic town of Sukhna at the Palmyra-Deir Ezzor highway and even captured Jabal Tuntur. However, the army reportedly repelled the ISIS attack on the part of the highway between Sukhna and Palmyra. 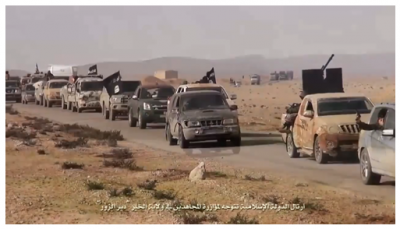 ISIS actively uses mobile assault groups supported by technical vehicles in the area. An intense fighting is ongoing. In the Euphrates Valley, government forces reached al-Ba’um village 2km north of the ISIS stronghold of Mayadin city. Local sources report multiple artillery and airstrikes on ISIS in Mayadin area. Russian submarines even launched Kalibr cruise missiles on ISIS there. However, it is not clear if the army has capabilities to storm this fortified point amid a complicated situation at the Palmyra-Deir Ezzor highway. The US-backed Syrian Democratic Forces (SDF) continued their advance against ISIS in the center of Raqqah city. Clashes are reportedly ongoing in Nahdah and Kurdan districts. Earlier reports appeared that ISIS conducted a large counter-attack and retook the blood bank building, al-Rasheed park, al-Rasheed high school and other positions around the national hospital in the city center. Nonetheless, a lack of photo and video evidence from the both sides does not allow to confirm or deny these reports.